Rations distributed by food aid programs are intended to improve the growth of undernourished children. In practice, food programs target individual children and provide a supplement to the family that is intended to increase the energy and nutrient intake of undernourished children. 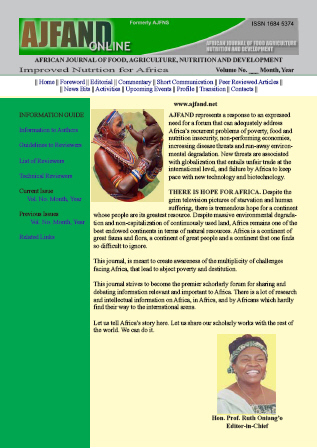 Multiple food rations are available yet few studies have compared their differential effect on the growth of children. The objective of the study was to compare growth in undernourished Senegalese children who received a newly developed dehydrated potato-soy protein concentrate blend (PSB) to those supplemented with the currently available corn-soy blend (CSB). The first child at each site was randomly assigned to receive PSB or CSB and subsequent children alternately received PSB or CSB. Eligibility for obtaining the food ration was based on criteria determined by the USAID (P.L. 480) Title II Food Aid Program. Children received iso-caloric amounts of the two supplements each month (23,000kcals). Weight, height and mid-upper arm circumference (MUAC) were taken over a four-month period. Z-scores were calculated for weight-for-age (WAZ), weight-for-height (WHZ) and for length/height-for-age measures (HAZ).The study was conducted at 7 clinics which served as food distribution sites in northern Senegal. The study enrolled 348 children 18-56 months old with a weight-for-age z-score below the "yellow" zone of the locally available growth chart (equivalent to WAZ ≤ -1.0). WAZ and HAZ significantly increased over time but there was no difference between the two ration groups. In a subset of 280 children (145 PSB, 135 CSB) who attended all four appointments and received the full complement of ration, there was significant and equivalent increase for both groups in WAZ and WHZ. These findings indicate that children participating in the food aid program significantly improved their growth over a four-month period. Using the new PSB as a ration had the same impact on growth as the standard CSB and required less fuel to prepare.